...but more than half of those at risk don't even know it. How to tell if you are and what you can do about it. As someone who cares about your health, you try to avoid sugar and refined carbs. You try to exercise. But despite your healthy intentions, you may still be at risk for a heart attack or stroke. You see, there is a silent assassin stalking you. This silent assassin kills 1 person every 10 seconds. And more than half of them never knew they were at risk. They never saw it coming. So what is this silent assassin? It's diabetes. Now I know what you're thinking. "I'm not at risk for diabetes." I hope that's true. I hope you're making the lifestyle choices that will lower your chances. Maybe you're taking supplements like chromium, vanadium, or gymnema sylvestre to balance your blood sugar. They are very effective. I prescribe them to my patients and see excellent results with them. But a healthy lifestyle and supplements may still not be enough to protect you. You may have a family history of diabetes ... you may have high blood pressure ... or high cholesterol ... or you may simply not get enough sleep at night. They are all risk factors for developing diabetes. You see, most people view diabetes as a disease where the pancreas is worn out. That's true. But there's a hidden cause that leads to the pancreas wearing out in the first place. I'll explain what this hidden cause is in just a minute. But first I want to share how one of my patients avoided becoming a victim. Antonio was 43 years old when he first came to see me four years ago. He complained of the two symptoms that I hear the most in my practice: being tired and overweight. His insulin levels were elevated, and he was showing all the signs and symptoms of pre-diabetes. He had no idea how to avoid getting the disease. But when he came to me, I showed him exactly what steps he needed to take to reverse the trend. Antonio followed my suggestions closely and brought his insulin levels back to normal in just 3 short months. Today, four years later, Antonio's insulin levels are normal. His cholesterol and triglyceride readings are at optimal levels too. And so is his weight. But even more importantly, Antonio feels good. He has the energy of someone ten years younger. So what did Antonio do? He fixed the hidden cause that was putting him at risk for type 2 diabetes in the first place. So what is the hidden cause? It's low energy. Now I'm not talking about feeling tired and rundown. It seems everyone feels that way these days. When I say "low energy," I'm talking about low energy in your cells. Having poor energy production not only puts you at risk for type 2 diabetes. Poor energy production also leads to many other serious problems, like obesity, heart disease, lung disease and even weak bones. As you may know, each and every one of your cells contains little "power plants" called mitochondria. And when these mitochondria produce energy efficiently, your cells burn fat well. Burning fat is critical to our overall health. Our cells were designed to produce a whopping 80% of our resting energy from fat. They get the other 20% of our resting energy from glucose. Dr. Frank Shallenberger has restored the health and vitality of thousands of patients using his revolutionary approach to health, aging and disease prevention. During his 25 plus years of practicing medicine, he has developed and pioneered many ground-breaking health treatments, including Bio-Energy Testing, CheZone, and Prolozone Therapy, and has trained over 500 doctors on how to use these techniques to heal their own patients. Dr. Shallenberger is the founder and medical director of the Nevada Center for Medicine. He is past president of the Nevada State Homeopathic and Integrative Medicine Association, and has served as a Clinical Instructor in Family Medicine at the University of California School of Medicine in Davis, California. Dr. Shallenberger has published numerous scientific papers, and is the author of two books, Bursting With Energy and The Type 2 Diabetes Breakthrough. The problem with diabetics (and people who are on the road to diabetes) is they begin to lose their fat-burning capability. And losing your fat-burning capability results in two problems. First, you start to gain weight. And second and more importantly, your energy production drops dramatically. But it gets worse. As your ability to burn fat and your energy production drops, your cells turn to the easy fix: glucose. When your energy production drops, you can't get as much of your energy from fat. So your cells turn to the easy fix: glucose. That's where insulin gets involved. Insulin stimulates the cells to produce more energy from glucose. But here's the problem: As your pancreas pumps more insulin into your body, your body develops a tolerance to it. So the insulin is less and less effective. The less effective the insulin is, the more it takes to do the job. So your pancreas pumps even more. Doctors call this condition "insulin resistance." Other terms are metabolic syndrome, syndrome X, and pre-diabetes. Now you can start to see the viscous cycle that starts to develop. First, cells fail to produce energy well from fat. And then, they don't produce energy well from glucose. This means that they aren't producing energy well from anything! After a few years, you find it harder to lose weight. You have less energy. And your blood sugar skyrockets. Plus the pancreas gets tired from producing so much insulin and wears out. Eventually, this condition turns into diabetes. But just remember this — it all started with decreased energy production. The good news is that when you reverse the problem, you can not only control type 2 diabetes, but eliminate it altogether! That's because you're not just "balancing your blood sugar" or "supporting your pancreas" — you're getting down to the root cause by improving your energy production. And you can find out how to do this in my ground-breaking book, The Type 2 Diabetes Breakthrough. If you're already suffering from type 2 diabetes, I'll tell you exactly how you can reverse this terrible disease inside the pages of my book. Even if you don't have diabetes, the life-changing health information I share in this book will help you feel younger, have more energy and avoid ever suffering from the debilitating effects of this fast-growing epidemic. There is good news. If you know what signs to look for — and you start making changes today — you can stop diabetes from happening to you. Just remember this. If you follow the recommendations that I give you to boost your cellular energy levels and prevent diabetes, you will also be doing exactly what you need to do to prevent all of the other diseases of aging. I'm talking about heart disease, strokes, Alzheimer's, and cancer. That's why I'm urging you to take advantage of this special offer on my book, The Type 2 Diabetes Breakthrough, right now. My ground-breaking book on type 2 diabetes regularly sells for $14.95, but I'm so convinced of its potential to improve your life that I'm offering it to you today for just $9.95 plus $3.95 shipping. That's $5.00 off the cover price of $14.95 — a 33% savings! I want to live a long, healthy life without the threat of type 2 diabetes. 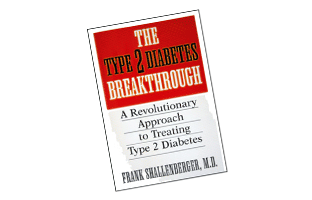 Send me my copy of The Type 2 Diabetes Breakthrough today! In my ground-breaking book, I not only explain exactly what causes type 2 diabetes, I outline 8 specific steps you can take to eliminate your chances of suffering from the disease. Many of my recommendations are shockingly easy to follow. Best yet, they'll all result in you feeling healthier and having more energy almost immediately. From exercise advice to specific supplement and diet recommendations, I outline each in detail inside the pages of my book. The surprising contributor to as many as one-third of all cases of diabetes. Results of study tracking 70,000 individuals over 10 years. Why the dietary guidelines published by the American Diabetes Association are nothing more than a recipe for keeping (or getting!) the disease — and what to eat instead. Why your breathing holds the secret to measuring the likelihood you will develop type 2 diabetes. And the simple test you can take that borrows from NASA technology to determine whether you're at risk. When to question your doctor when he says you have "normal" levels of insulin. Discover the cutoff number that means your insulin levels are too high — and what you need to do immediately if you reach this level. The one activity that will reduce your chances of dying from type 2 diabetes by 58%. The one supplement that singlehandedly reduces blood sugar levels by at least 30% in non-diabetic patients and by at least 20% in one-third of all diabetics. Bonus: it helps improve energy and slow down the aging process too! Why exercising a particular way can actually INCREASE your chances of contracting type 2 diabetes — and what exercise routine you should follow instead. Yes! I want to live a healthier life and ensure that I will never suffer the pain of type 2 diabetes. Send me my copy of The Type 2 Diabetes Breakthrough today! The recommendations you'll find in this life-changing book won't just help you or someone you love avoid type 2 diabetes. "Bursting with Energy... Glowing with Vitality and Health"
"Wow! I have been on Dr. Shallenberger's comprehensive type 2 diabetes program for almost two years, and the changes have been nothing short of miraculous! I am not only bursting with energy, but glowing with vitality and health, not to mention increased stamina and no more sleepless nights. Something else I have been able to accomplish as a result of this program is a complete normalization of my blood sugar levels." 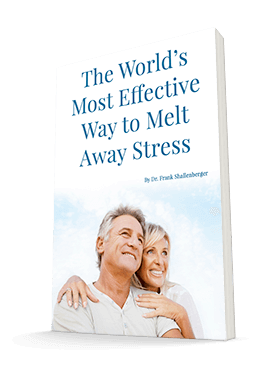 Inside its pages, you'll also discover healing secrets that will give you back the energy you used to feel many years ago. How to discover if you're getting the optimal amount of sleep your body needs. This easy test takes just 20 minutes or less. Why following this popular diet plan could skyrocket your risk of contracting breast cancer by 600%. The shocking number one predictor of mortality in a study of more than 1 million Americans. Read this to discover if your own health might be in danger — and the easy change you can make to extend your life. The common food ingredient that blocks your ability to produce energy and increases your risk of blood clots. I guarantee that you'll find it in several of the foods in your kitchen pantry right now. Can't sleep? If you wake up in the middle of the night, avoid doing these two things, and you'll fall back asleep much more quickly. The two basic mistakes that almost all Americans make every day when they eat. Find out what they are and how to avoid them. Why expanding your chest when you breathe is actually bad for you. Make this one simple change to your breathing and increase your energy, reduce your stress and slow down the aging process. Yes, I want to feel years younger! Send me my copy of The Type 2 Diabetes Breakthrough today for just $9.95 plus shipping! I'm so confident that you'll improve your life with the information found inside the pages of The Type 2 Diabetes Breakthrough that I'm willing to refund you every penny you paid if you're not completely satisfied. If you follow the recommendations outlined in my book and DON'T begin to feel healthier and more energetic within 90 days, simply return the book for a full refund. You have nothing to lose, so act now! Complete the order form below. To delay may cost you your health. Yes, I want to live a healthier life and ensure that I will never suffer the pain of type 2 diabetes. Rush me my copy of The Type 2 Diabetes Breakthrough today! You'll pay just $9.95 (that's $5.00 off the cover price) plus $3.95 shipping to have The Type 2 Diabetes Breakthrough rushed to your doorstep today. And I'm so convinced that the eye-opening health information you'll find inside its pages will change your life that I'm willing to give you every cent back if it doesn't. P.S. I've personally treated hundreds of patients who were well on their way to getting diabetes when they came to my office. After following my recommendations, they've seen remarkable improvements in their energy levels, their overall health and — most importantly — in their insulin levels. And I share with you everything that I told them in The Type 2 Diabetes Breakthrough. Order your copy today! Your satisfaction is guaranteed! If you are unhappy with The Type 2 Diabetes Breakthrough for any reason, return the book within 90 days in salable condition and you’ll get a full refund of every penny you paid including shipping and handling. You can’t lose!